Football, which may have come to Ireland from Britain, was originally a peasant pastime based on the parish or village. It was unregulated and violent, and fatal accidents occurred during matches with alarming frequency. One challenge between neighbouring villages in Co. Derry read, ‘for the Late Sleepers to come over on [a certain Sunday] and kick the Early Risers’. The Statutes of Galway (1527) forbade hurling and other sports ‘except alone football with the grate ball’. Literary references indicate that football was played in north Co. Dublin in the late seventeenth century. The poet Matthew Concanen, writing in 1720 to celebrate the victory of his native village, Swords, over neighbouring Lusk, reveals that the ball was made of oxhide ‘stuffed with the finest hay’; the goals consisted of boughs of sallywood bent into a bow; the ball could be caught and kicked in the air, kicked and rushed along the ground, or carried; and tripping and wrestling, while not strictly legal, yet fell within the spirit of the game. In some parts of the country this game was known by its Irish name of caid. As local matches so often resulted in riot and disorder, the game was regularly declared illegal (Edward II banned football in London in 1314!). Not, however, until Sir Robert Peel organised his police force in England in 1829 was the law regularly enforced; the peelers then cracked down on the undisciplined brand of football prevalent in England, just as a more disciplined code, or codes, had begun to develop in the public schools. Although William Webb Ellis (who, in 1823, caught the ball and ran with it in a game at Rugby School) is regarded as the progenitor of modern rugby, the spread of the game owes more to Thomas Arnold, the celebrated though controversial headmaster of the school from 1828 to 1842. There is little evidence that Arnold himself was interested in football, although he plays the role of benevolent spectator in the account of the famous Bogside match in Tom Brown’s Schooldays, but the account is based on an original written by W.D. Arnold, son of the headmaster. In any case Arnold would have been shrewd enough to discern the advantages of organised sports, such as cricket and football, compared with the drinking, bullying, gambling and poaching that were standard diversions in the public schools of his day. Many of Arnold’s proteges obtained headships, and his influence on the public school system was such that the code of football then practised at Rugby was implanted in schools such as Cheltenham, Marlborough and Rossall. 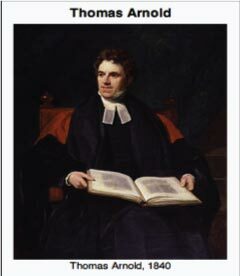 The style of education attributed to Arnold was based on Christian values, character building, a system of accountability for boys and masters, and Plato’s Hellenic ideal of mens sana in Corpore sano; as this became the model for the Victorian public school, so the rugby gospel spread through those who had served under him. Eton, Charterhouse and Westminister, however, practised another code in which handling was not permitted, leading to the development of association football or soccer. And I warrant, ere long, you’ll get kicking enough. At the time when Ned Lysaght was in Trinity College [c. 1780] the fellow-commoners considered themselves superior beings to the pensioners; and of course they were above taking any part in the amusement of football which was then played every evening in the College Park. It so happened that a pensioner whose name was C-lf-ld, had been vain enough to associate entirely with fellow-commoners, and, of course, never deigned to play at football, until one evening when he accidentally condescended to do so; scarcely had he made the attempt, when some of his fellow students (pensioners) indignant at his past folly, soon tripped up his heels, to the no small gratification of the whole assemblage then present, but to the mortification of C-lf-ld and his companions. The first formal record of the university club, indicating that it had been in existance for at least a year, appears under the heading ‘Trinity College’ in the Daily Express of 1 December 1855: FOOTBALL. – A match will be played in the College Park today (Saturday) between original and new members of the club. Play to commence at two o’clock College time*. 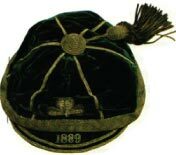 The 1854 foundation date gives Trinity a substantial claim to be the oldest rugby club in continuous existence. Guy’s Hospital FC, which was founded in London in 1843 and played its football initially on Kennington Oval, is certainly older, but went into abeyance for some years in the nineteenth century. For a number of years afterwards, all fixtures were internecine struggles between Internals and Externals, Fair Hair and Dark Hair, Sophisters and the Field, the Football Club and the Boat Club, Cheltenham boys or Royal Schools versus the Rest, or Graduates and Senior Sophisters versus the Minor Classes. Football in Trinity also clearly pre-dates any distinctions between the Rugby, Association and (much later) Gaelic codes. Football seems to have been played in Irish schools including St Columba’s and the Royal schools of Armagh, Dungannon and Portora. A photograph exists of a Trinity team of former Dungannon Royal School boys taken in 1873. University Football Club. A match will be played, weather permitting, on Saturday next December 1st, between the above mentioned club and “The Wanderers” in College Park commencing at 2 o’clock College time. although the University out of courtesy to the strangers, at first played contrary to the custom by the Eton rules, they succeeded in holding their own in one of the first two matches, and were only beaten after a close contest in the other. In the third match in which Rugby game was played they won an easy victory. Traill was an early stalwart of the Football Club, as were Arthur Palmer, a fellow and distinguished Latinist; the mathematician and Celtic scholar Charles Graves, a fellow until consecrated Bishop of Limerick in 1866; and Grave’s three sons, Alfred, Arnold, and Charles. Alfred was a collector of Irish music and the composer of ‘Father O’Flynn’, while Arnold was an international cricketer, a champion hurdler, and a leading proponent of technical education in Ireland. But the most remarkable of the pioneers, and the one who deserves to be known as the father of Irish rugby, was Charles Burton Barrington, who captained the club for three years from 1867 to 1870. A little desultory football, with no particular rules to speak [of], or kit. A good little chap called Wall was running the show. I started away and pulled things together, made a good club out of it with rules of Rugby School, and we were very successful for it caught on at once. I have a photo of our First XV by me, and we are a queer-looking lot judged by modern ideas. We had caps made in Rugby too, but there was no-one in those far-off times to play against. The match of the year was against the Medical School. Sometimes too the Dublin Garrison boiled up a team to play us … We played matches among ourselves, ‘pick up’ twice or three times a week … The Club was really a great success and did introduce the Rugger game into Ireland. The club had no rules, written or unwritten. The[y] just played and ran with the ball, no touch line, no goal lines, our only parpanalia [sic] being the Rugby goal posts. These were all sufficient for the simple tastes of those days in Dublin Football. A Rugbean brought in the new idea of Rules. Rugby [School] itself though had no written rules!… They were traditional, like the British Constitution or the Secrets of Free Masonry. The Kick-off from the middle of must be a place-kick. Kick-out must be from 25 yards out of goal, not a place-kick. Charging is fair in case of a place-kick, as soon as the ball has touched the ground; in case of a kick from a catch as soon as the player offers to kick, but he may always draw back, unless he has touched the ball with his foot. If a player makes a Fair Catch, he shall be entitled to a free kick, provided he claims it, by making a mark with his heel at once; and in order to take such kick he may go back as far as he pleases, and no player on the opposite side shall advance beyond his mark until he has kicked. A Fair Catch cannot be made from Touch. A Player is off side when the ball has been kicked, thrown or knocked on, or is being run with by one of his own side behind him. A Player off side may impede the game by standing close to the ball; but he may not, in any case, kick or touch it, charge or put over. A Player is on side when the ball is kicked or thrown or knocked on, or when it has rebounded from the body of another player of the opposite side. It is not lawful to take up the ball when not in touch, except in an evident hop. Lifting the ball is strictly prohibited. Running in is allowed to any player onside, provided he does not run through touch. If in case of a run in, the ball is held in a maul, it shall not be lawful for any other player on his own side to take it from the runner and run with it. It shall be lawful for any player to call upon any other player, holding the ball in a maul, to put it down, when evidently unable to get away. A Player, if he wishes to enter a maul, must do so onside. No Player, out of a maul, may be held or pulled over, unless he himself is holding the ball. No hacking, as distinct from Tripping, is fair. Try at Goal. A ball touched between the goal posts may be brought up to either of them, but not between. When the ball has been touched down behind the goal, the player who touched it down is entitled to walk out straight 25 yards, and any one of his side may take a place-kick, but as soon as the ball had been placed, the opposite side may charge. It shall be a goal if the ball is dropped, but not if punted, hit or thrown, between the posts or posts produced at any height over horizontal bar, whether it touch it or not. No goal may be kicked from touch. A Ball in Touch is dead; consequently, the first player on his side must, in any case, touch it down, bring it to the side of the touch and throw it straight out. Holding and throttling is disallowed. Sneaking in opponents’ goal is discountenanced. No law may be altered or made unless at least a week’s notice be given of the meeting, and such meeting shall consist of at least 20 members or more. We have forwarded to the principal leading clubs the rules by which we play, in the hope that for the future we may be able to secure players thoroughly acquainted with the science of the game, a want which has hitherto proved an obstacle to our efficiency in the field. After a careful revision of the rules of all the leading clubs, we have thought fit to compile a code which we hope will meet the approbation of all. In those days no-one was allowed to put his head down in the scrum, if he did it was immmediately pulled up again by the others. The forwards all stood straight up hacking away for all they were worth at the opposite side. All standing straight up, packed close together and wearing very heavy boots. The only swing in their kicks being made with their jerking heads. This may seem a bit of an Irish way of putting it. Before my time they had what was called a Hallelujah at the end of a house Match…..The ball was taken away. All the players went into the scrum and hacked each other away dutifully for five minutes. That was the finish and all went to their houses to hot water, footpans, tea and baked potatoes. The latter being a treat in a House Match always. Some of the rules I remember, hacking was barred but tripping was allowed. Passing was against the rules – it was called hand ball. We played without a referee. There was offside of course. The scrummages were interminable and lasted until the man holding the ball expressed his willingness to put it down, and that was only when his side was losing ground. I have seen a scrummage travel half way down the ground…and as there was no passing one often saw very fine long runs – sometimes even three-quarters of the length of the ground, with wonderful swerves and dodges…in every respect the game was more individual and scientific than it is today. Some of the rules I remember, hacking was barred but tripping was allowed. Passing was against the rules – it was called hand ball. We played without a referee. There was offside of course. The scrummages were interminable and lasted until the man holding the ball expressed his willingness to put it down, and that was only when his side was losing ground. I have seen a scrummage travel half way down the ground…and as there was no passing one often saw very fine long runs – sometimes even three-quarters of the length of the ground, with wonderful swerves and dodges…in every respect the game wasmore individual and scientific than it is today. Little Wall and myself sat in conclave in his rooms in Botany Bay and on the lines of Rugby custom drew up the schemes. We introduced, however, knickerbockers in lieu of flannels – this was done out of respect for the black earth of our College Park. We decided on the colour being Red and Black for the very same reason. The committee accepted these proposals without demur, and the arrival of the new kit which had been ordered from Rugby, caused quite a stir in the college, as formal uniforms for football were a novel idea in Ireland. The caps were red and black quartered, with a gold shamrock on the front, and similar caps with gold shamrocks were worn by first team members of other Trinity clubs. The shamrock was surrendered during the 1880-81 season to become the emblem of the IRFU, and was replaced with the university coat of arms in red and black. An all-white strip for the first fifteen, with red and black socks, was introduced in 1893-4. No Dublin club was allowed to play the Trinity first team without first defeating the second team, which had been formed in 1867. The first fixture to be played outside Dublin was against the North of Ireland Football Club, Belfast, in 1870. 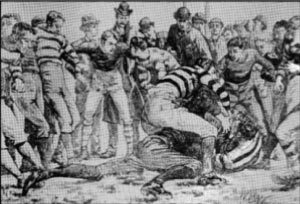 In December 1873 the club made the first of many journeys across the Irish Sea to play the Dingle Club of Liverpool under the ‘new’ Rugby Union rules; and when Dingle made the return journey, the match in College Park attracted a crowd of 3,000 spectators; the urge to play at international level was already developing. A meeting of DUFC was held twelve months later to arrange a game between Ireland and England, at which the secretary read a letter from the secretary of the English Rugby Union (formed in 1871) suggesting dates for the match in the following February. The other clubs were notified, and nominated their representatives. This meeting was held in the Grafton Street premises of the sports supplier John Lawrence, editor of the celebrated Handbook of Cricket in Ireland. Dublin University, Wanderers, Lansdowne, Bray, Engineers, Portora Royal School, Dungannon Royal School and Monaghan were represented, many delegates of the other clubs also being Trinity men. Significantly, the most prominent of the Belfast clubs, North of Ireland FC, was not represented at this meeting. Before this game took place, a meeting was held in Belfast in January at which a Northern Football Union was formed. It was agreed to offer “physical assistance” to Ireland in the forthcoming international, and a Belfast versus Dublin challenge was arranged for later in the season. the first match met in Trinity and, before doing anything else, elected themselves en masse? If there was no room for a back he went on as a forward!’ The DUFC then handed its crest, consisting of a sprig of shamrock, to the newly formed Union to be the Irish crest and replaced it with the arms of the college. These first DUFC men to win representative honours were the initiators of a long tradition, for over 150 members of the club have played rugby for Ireland (more than in any other Irish club); the club has also produced English, Welsh, South African and American internationals. Trinity has also supplied many Presidents of the IRFU, one of whom, George Scriven, sensibly ensured that, in the season in which he held office (1882-3), he was also an international selector and captain of the Irish team.